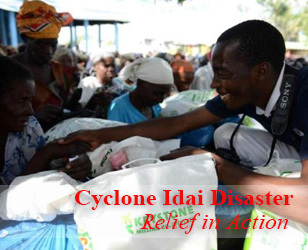 Moved by the work of the foundation in helping the victims of natural disasters in his country, the former mayor of an Australian city donated the equivalent of more than US$75,000 towards its relief work and put on the vest of a volunteer during a relief distribution. This year Australia has suffered the double blow of severe flooding in the eastern state of Queensland and a wildfire in the western city of Perth. Volunteers have been active in relief work in Queensland and held their fourth weekend of distributions on Saturday, February 12 in Brisbane, the state capital. The event was held in Nudgee Junior College, for residents in the west of the city. Among the volunteers was Gary Baildon, former mayor of Gold Coast, who donated a check of A$75,000 (US$75,266) on behalf of himself and his friends. Gold Coast is a city of 400,000 people in southeast Queensland, the sixth most populous city in the country. "I hope the money can benefit more needy people and believe that giving is more blessed than receiving," Baildon told the audience of more than 100 people. He handed out medical kits to the recipients and shared the story of the bamboo bank, which the foundation has used since the beginning of the foundation. "I encourage everyone to save coins in the bamboo bank in their daily life and donate it to Tzu Chi," he said. A total of 115 families received the relief goods, including 110 medical kits, 293 blankets and 110 cash cards. The volunteers presented the items with a bow and a hug. The recipients were touched not only by the goods but also the shoulder of support they were given. Asitha Dulari De Silva emigrated from Sri Lanka and lives in the Brisbane district of Rocklea: he stayed in the evacuation center for three days because of the floods. 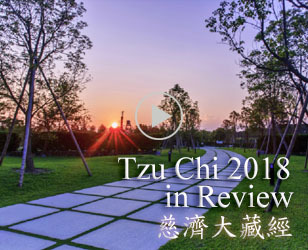 Tzu Chi made a deep impression on him and he has kept a small book of Jing Si aphorisms. After the distribution in Rocklea, he has a better understanding of the foundation and saw a documentary of its relief work in Sri Lanka after it was hit by the Asian tsunami in December 2004. 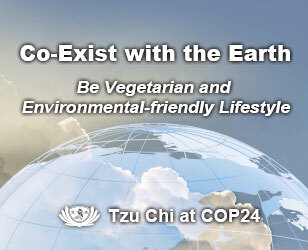 He vowed to join Tzu Chi and will invite his wife to participate. The land of Australia has been severely affected by many natural disasters recently; this had made people think about our environment and brought out the goodness in people. The survivors have gradually recovered from their sorrow and started to help others. Before he left, Baildon presented a bamboo bank to everyone and encouraged them to be a giver. Chen Yaying, chief executive of Tzu Chi in Australia, said that everyone could make a good vow, while they dropped in coins. "By making a vow every time in a bamboo bank, it will not only accumulate money but also love." she said.